The colorful Castro District in San Francisco is home to this charming motel nestled on a tree-lined street near many local attractions restaurants bars shops and night life. Free Wi-Fi and free parking are included. Becks Motor Lodge is ideally located only moments from the citys street car lines offering direct access to Fishermans Wharf Pier 39 Union Square and much more. Free Wi-Fi and free parking are included as is a small refrigerator and cable TV. Each room has a private bathroom. While staying at the lodge guests can enjoy a spacious deck overlooking Market Street. The motel also provides on-site laundry facilities for guests. 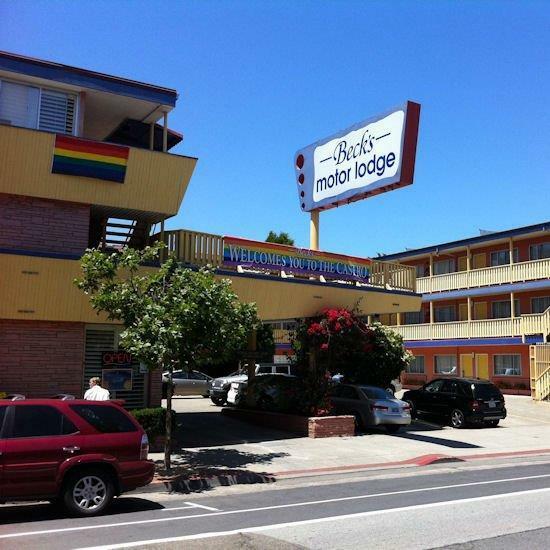 Becks Motor Lodge is located in the heart of the Castro conveniently located next to many restaurants shops bars and attractions. The motel is also close to UCSF Hospital and California Pacific Medical Center Davies Campus. Public transportation is available within steps of the front door. At Frances chef Melissa Perellos daily-changing menu reflects modern California sensibilities and focuses on ingredients from local markets farms and producers in a casual neighborhood setting. A family style restaurant with big portions of salads sandwiches and breakfast items. Dolores park offers several features including many tennis courts a basketball court a soccer field a childrens playground and a dog play area. The southern half of the park is also notable for its views of the Mission district downtown. One of the busiest and well known tourist attractions in the western United States Fishermans Wharf is best known for being the location of Pier 39 San Francisco Maritime National Historical Park the Cannery Shopping Center Ghirardelli Square. Golden Gate Park is the third most visited park in the United States. While the park is free to visit during the day popular attractions charge admission such as de Young Museum California Academy of Sciences and Conservatory of Flowers. Mission Dolores has always had a central place in the religious civic and cultural life of San Francisco. Mision San Francisco de Asis was founded June 29 1776 under the direction of Father Junipero Serra and is both the oldest original intact. This one-block plaza and surrounding area is one of the largest collections of department stores upscale boutiques gift shops art galleries and beauty salons in the United States making Union Square a major tourist destination a vital cosmopol. California Pacific Medical Center is one of the largest private not-for-profit academic medical centers in California and is a Sutter Health affiliate. As a tertiary referral center the Medical Center provides a wide variety of services. The Moscone Center is the largest convention and exhibition complex in San Francisco. From check-ups to organ transplants UCSF provides world-class care. Ranked among the top 10 hospitals in the nation and the best in the San Francisco Bay. Large shopping center in downtown San Francisco featuring many shops including Nordstrom and Bloomingdales. San Franciscos famous gay and lesbian neighborhood is filled with interesting cafes bars night life and shops that are not to be missed. The Castro Theatre draws movie buffs year-round with film festivals and movies of every genre. A multi-purpose arena in San Francisco California currently named after promoter Bill Graham. The arena holds 6000 people and was built in 1915 as part of the Panama-Pacific International Exposition. A 94-foot-tall "singing" metal sculpture, perched atop one of San Francisco Bay's windy hills. Built in 1967 artists Lucia and Aristides Demetrios. ~11 miles from San Francisco.